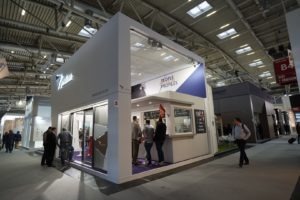 At BAU 2019, the profine Group, system provider of the KBE, Kömmerling and Trocal brands, was represented in Hall B4, Stand 528. The presentation focused on solutions to megatrends such as barrierfree access as well as on top issues such as sliding systems. For example, with “PremiPlan Plus” profine presented a premium threshold system for maximum accessibility with a high level of comfort, when installed at ground level at zero millimeters. “PremiPlan Plus” is not just a threshold, but a complete system developed in cooperation with manufacturers of other building trades. Even before its official market launch, the innovative system was the winner of the pro-K award 2018 in the category of domestic installations and technology. Sliding systems are also in line with the trend. Here, too, profine could present a remarkable product, in addition to the popular lift/sliding doors PremiDoor 76 and PremiDoor 88: PremiSlide 76 is a compact, efficient and versatile sliding system. The new product is based on the 76 mm double seal platform of the system provider and thus provides the manufacturer per se with a high degree of compatibility. As an additional exhibition highlight, the profine project management presented an extensive range of services for architects, housing associations, contract placing authorities, and manufacturers. The range of consultancy services includes planning, bids for tenders, installation, and onsite approval procedures. “We understand system competence holistically and see ourselves as the contact for all involved in the building process. Accordingly, we want to focus not only on innovative products, but above all on our services expertise for the various players in the industry,” explains Dr. Peter Mrosik, owner and CEO of profine.